The weekend is, sadly, coming to a quick and exhausted close. Karl and I (and Nate?) hosted our annual friends christmas party this year. It is in its fourth year of existence and the dirty santa presents continue to get more and more amusing! I do love how some traditions extend to more than just family, because, let's face it, sometimes our friends ARE family. (um, wow, right? AND it tasted A-mazing.) (If you didn't figure it out, Kristen and JR got married in Vegas.) She also supplied us with other varying forms of desert deliciousness including something called Elf Bites which are like these little mini, super-itty short bread teensy tiny squares of heaven. Nate conked out within the first hour of the party and didn't make a peep all night (even when the Weezer concert began happening around 1 a.m. in the Living Room.). Audra with her Opposum that she won and proceeded to carry around petting all night (with the creepy tail wrapped around her arm!) The tag on the possum said that they are "friendly, non-agressive creatures" which, according to the majority of our party guests (who have, apparently, combated possums head to head, er, mostly with brooms) this is NOT the case. Whatever the case is they are a little creepy, yes? The tag attached to this little guy was SO ridiculously positive that I imagine there is a creepy possum loving population out there advocating to change the images of possums EVERYWHERE. I feel like the party was a SUCCESS. i had some pre-event jitters prior to the start of the party, which is weird because we entertain pretty frequently. 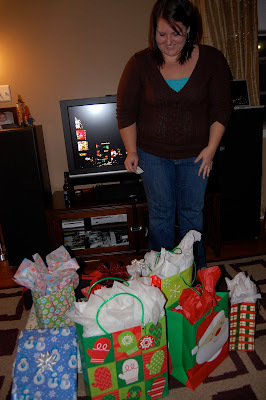 I guess I just felt the CHRISTMAS PRESSURE here too, because everyone there has definitely seen my house DIRTY. THIS WAS MY FOURTH ATTEMPT and after half a roll of wrapping paper (the same ONE roll of wrapping paper I have had for, oh, three years!) I quit!! There was still a ripped corner, and I had neither scotch tape nor bows. I might need lessons. haha! 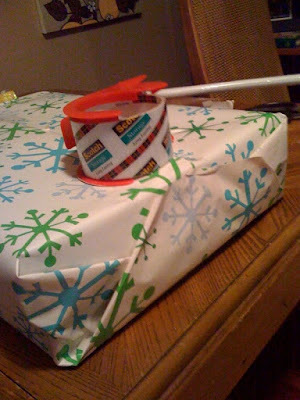 nice wrapping job.. I was actually just watching a youtube video on making bows.. Yeah, I know. Anyway, cute cute! Love the family photo! :) Nater's hair is SO BLONDE! Goodness! And Audra's gift is scaring me.. esp that she carried it around all night. *nervous* haha.. :) Cute cake. I've been wanting to be more domestic lately but there's this looming fear of failure at doing anything betty crockerish. I love your dress, your family photo and that cake!! Thanks for hosting, you guys. It was truly a blast. I will post pics soon. ALL of them involve people throwing their head back in laughter. It was a good night! PS, we totally killed that Weezer song(s). And Salt N Pepa. Aaaaaaand Bush. :) Sorry Nate! I'm so bummed I missed out on the party! My nieces and nephew were in the Nutcracker, and we ended up taking them out for fancy dessert, which lasted WAY later than expected. On opossums...in high school, I volunteered at a vet's office. One day, I came in, and somebody had boarded their PET opossum. And the employees tried to trick me into believing I was going to be the one to give it a bath. Sick. wow. that cake looks awesome. your friend is talented. i am not an awesome gift wrapper but I could give you some pointers. I am mostly upset about missing out on the cake. I need to see your boots closer up!